Create your the setup of your dreams and save 10% on the total price! You can choose out of our complete product range. You can choose any kind of frames: Freestyle-, antirocker-, flat- and powerblading-frames! All combinations are possible: You can choose a flat-frame together with grindrocks in the middle position. Because grindrocks need no bearings you can also choose "**no bearings**" for the middle wheels. 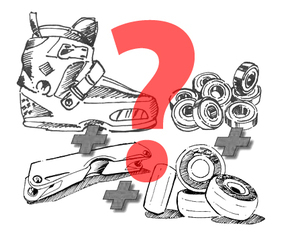 It is even possible to choose no wheels and bearings for the middle position. If you choose a frame which already has grindwheels or grindblocks you can choose wheels and bearings for the middle position anyway, so you can create a flat-setup with an antirocker frame for example. You can choose from our entire range. Choose boots, frames, bearings and wheels and check how the price changed.